ChefShop.com/enews - "Upside Down Cauliflower, Garlic, Yuzu Kosho"
An offshoot of the Brassica oleracea family / species, cauliflower is the tight, white-headed one. It's beautiful cooked as one unit and it turns out, when cooked as a whole, the results can be quite firm yet nicely soft. Out of a desire to cook only on the grill, to use no other heat source, and to not have everything taste "grilly", I decided to encase the whole cauliflower upside down in a shell of aluminum foil and put it on the grill over indirect heat. First, I carve out the center core to make a "pocket". I then drizzle the entire head with olive oil, a lemon oil or a pepper oil is ideal, flip back over and add about four teaspoons of butter (more or less, depending on your desires), sprinkle with sea salt, and add a little Katz' Honey Vinegar - about a tablespoon. The Agro Dolce (sour-sweet) will add a nice taste hit and a little contrast to the flavor of the cauliflower, but it does take away the clean white color of the flower. Cover with foil. 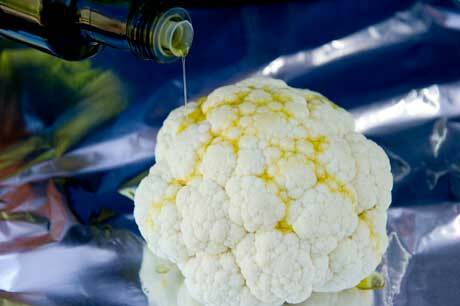 Throw on the grill, flower down, butter up, and when a fork can enter easily, remove from the heat of the fire and open. Remove head, flip / roll and place it whole on plate/serving dish. Drizzle with the juices that remain in the foil, sprinkle with a little more olive oil, add some more vinegar or butter over the top, or just eat as is. A good sharp knife works as a perfect serving tool and lets your guests cut off their own piece as desired. In the food business there is a wonderful mix of people, most with previous careers; this is my third. Passion for fancy food, love of good taste, and the closeness to where our food comes from are just a few reasons some of us have come to rest here. For me, it is the people, many of whom have become fast friends, that keeps me on this emotional roller coaster of business. We have been blessed to meet and work hand-in-hand with so many amazing food people many of whom are true scholars of their passion. Like so many of those we have met, most are unassuming people, down-to-earth folks. And, when you ask a question, you usually discover a person who has a wealth of information about their particular passion. These relationships are what life is all about. And, sadly, this past year two wonderful people, partners in life, have passed. Arlene left us just over a year ago, and now just a few weeks ago, Arlene's husband and garlic farmer, Chuck. If you live here and frequented the Ballard Farmer's Market, you know all about the wonderful produce that Anselmo's sold every Sunday, rain or shine, winter or summer. Marie, Arlene's daughter, along with Chuck, started this family farm. And, along with her sister and their Mom, Marie has been selling at the Ballard Farmer's Market every Sunday since August, 2000. Amongst all the produce that they sold was always Chuck's passion, hardneck garlic. It was revered by local chefs who often made the trek to Ballard to pick amongst the large number of varieties, from hot and spicy to mild and sweet. For a small family farm their passing was devastating on so many levels, and for Marie it meant that it is time to retire. 2011 will be their last garlic harvest. In about a week, she and her husband will pull the garlic from the ground. Then, the laborious task of cleaning and peeling will start and probably go on for days. Then, the garlic will be hung in their greenhouse to dry. The work is hard and long, and time will pass before they and you see the fruits of their labor. If you have in the past eaten their garlic you know how good it is. 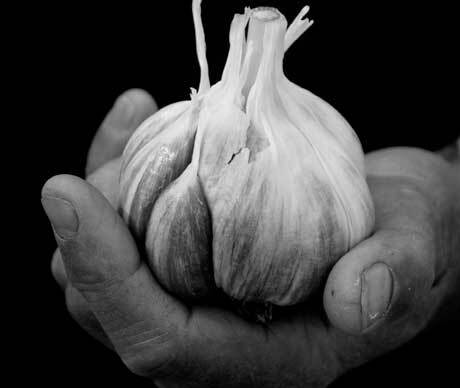 If you have never endeavored Anselmo's garlic, this would be the year to do so and help the family while you are at it. Yuzu kosho is a blend of the rind of the yuzu (a citrus fruit with notes of grapefruit, lemon and lime) and kosho (a spicy green chile), mashed together with a good deal of salt: three powerful flavors colluding in a ravishing relish. A simple combination, but the flavor is so savory-sweet-pungent that you might be tempted to slather instead of dollop! Use a little restraint, though; the stuff packs some intense heat. Originally a specialty of the Kyushu area - where it's often paired with yakitori, a dish of skewered meat cooked over charcoal - yuzu kosho's popularity spread throughout Japan and is now making its way into the international culinary scene. Its versatility and persuasive flavors work well with so many dishes. Stir it into a bowl of udon noodles and top with some cooling shiso, a Japanese herb in the mint and basil family; toss it with saut�ed eggplant, onions and tomatoes mellowed with purple basil; use it in place or alongside your ginger and wasabi (preferably fresh wasabi!) with sushi. For an international take, try combining it with oil and marinating some flank steak for an out-of-sight fajita filling; add it to a garlicky aioli for a twist; or stir it in to a dried-fruit-and-nut-spiked pilau. 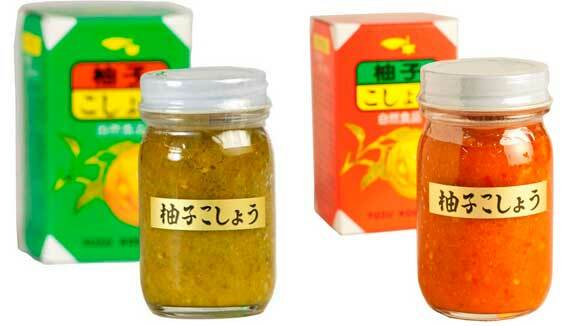 Shop now for Yuzu Kosho! This distinctive olive oil has won so often at the annual Agricultural Show in Paris - it won a gold medal 9 out of 10 consecutive years - that the French Ministry of Agriculture awarded it a special Prize of Excellence in 2002 and 2004, for representing one of the best producers for integrity in production and excellence in results. This is an A.O.C. Aix-en-Provence olive oil, which, among other qualifications, means that it is a blend of the particular designated olive varieties, primarily the two "queen" olives of Provence, the Salonenque and the Aglandau, as well as as small amount (15% total) of Picholine, Grossanne and Lucques. At first taste, this oil has a very grassy, green artichoke flavor, with just a hint of pepperiness. In French, this quality is called ardeur, meaning that it has a little kick, a little energy - the opposite of mellow. But this is not an olive oil that leaves that peppery, burning feeling in the throat. Instead, it's very long on the palate, where it develops into a beautiful almond finish, without any bitterness. The Early Robin and Rainier cherries have shipped. Now we move onto the sweet dark red cherries. Bings are coming soon. No set date yet. Keep Checking on Facebook for updates. Loved by many, including Food and Wine Magazine, these ribs are always good, whether you burn them to a crisp or cook them just right to a soft, smooth, just-done with just the right crisp. Fun to eat this is a treat! Add some spice to your life with exotic Moroccan food. From the exotic, to the quixotic, watch as Erin puts together a traditional chicken tagine with preserved lemons, and a delicious quinoa couscous, and more. Five spaces left. Does your grilling repertoire begin and end with steak and the occasional veggie? Take your outdoor cooking one step further by putting all that good heat to work for you. We will make an entire dinner on our outdoor grill, even dessert! Bring your long tongs and get your sun hat on - and come cook in our parking lot! Cooling foods for a hot-weather climate. Want to indulge your taste buds all summer long, but don't want to overheat your kitchen? Learn tips and tricks from the masters of keeping things cool, and learn why the "Mediterranean Diet" is simply a way of living, and eating well. Summer stone fruit galore, and looking for something quick and easy to do with all that fruit? Try this recipe for stone fruit slaw from this month's copy of Bon Appetit Magazine. Another grilled fruit recipe that just hits the spot this time of year. Perfect for those early season peaches that just don;t quite have the sweetness yet. The grill brings out the best in the peaches, and the honey creme fraiche just can't be beat. This recipe is so simple. Lamb cooks in a snap and allows the lamb to shine. One of the most expensive lamb cuts you can buy, but well worth it if your butcher is willing and knows what they are doing.